The flex metal wheel kit is SafeTec’s patented wheel kit. It is only available on the 3 Step X-Deck. 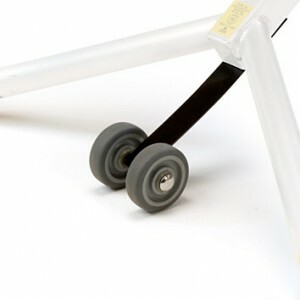 The wheel kit has enough strength to hold the X-Deck up in the air on its wheels and as soon as 12 lbs of pressure are applied to the X-Deck the metal on the wheel kit flexes and you are on all 4 of the grippy rubber feet. This wheel kit will flex and then return back to its regular shape for a lifetime. A number of wheel options are available upon request.